Augmented reality or virtual reality? Which is the future of entertainment and computing interaction? Perhaps the answer is both, but were you to ask the questions at Apple's Cupertino HQ, it's seeming increasingly likely that you'd get a chorus of pro-AR shouts. 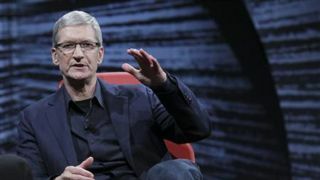 Apple CEO Tim Cook has once again thrown his weight behind augmented reality as the next big tech talking point. Speaking at the Utah Tech Tour over the weekend, Cook suggested that a "significant portion of the population of developed countries, and eventually all countries, will have AR experiences every day," going so far as to say augmented reality use will become as common as "eating three meals a day". However, Cook didn't reveal any concrete device or software plans in relation to AR from Apple, conceding that it will be some time before the quality of AR becomes "acceptable". Apple traditionally waits for established markets to occur before jumping in and refining a product around them, and it seems the same tactic will be applied to augmented reality. "AR is going to take a while, because there are some really hard technology challenges there," Cook said. One thing that does seem increasingly certain however is that Apple has little interest in virtual reality -unlike Google, which is ploughing resources into its Daydream VR division.